You know how some guitarists always sound GREAT, no matter what they play? You want to play like that too, right? … but you might not know how. You are not alone… many people struggle with this. Good news is: there are a few simple tricks your favorite guitar players use to make their playing sound amazing. These techniques are easy to learn, fun to play, and impressive to hear. 5 killer guitar playing tricks that make your playing sound better than ever before. You can learn these tricks in about 10 minutes, even if you are not an advanced guitarist yet. How to grab your listeners’ attention with only one note and make them want to hear more of your awesome playing. 5 things your favorite guitar players do to make anything they play sound incredible… and how you can do it too. What it really means to “play guitar with feeling” and how to make it drip with fire, passion and emotion. 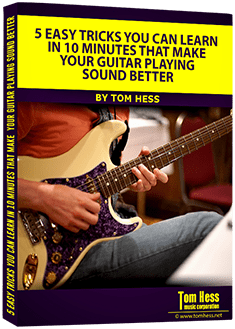 To learn (for free) how to make your guitar playing sound better fast, enter your name and email address and click the 'Give Me Access Now' button. All information is kept 100% private and confidential.